Welcome to all my new visitors... and a big bloggy [hug] to all you followers who are stopping by to say hi! So, I don't know if you have had a chance to visit Etsy.com at all. If you are not familiar with it, it's a great online "store" where people can post their own handmade or vintage items for sale. I could (and sometimes do) spend hours just browsing all of the fun things people make! 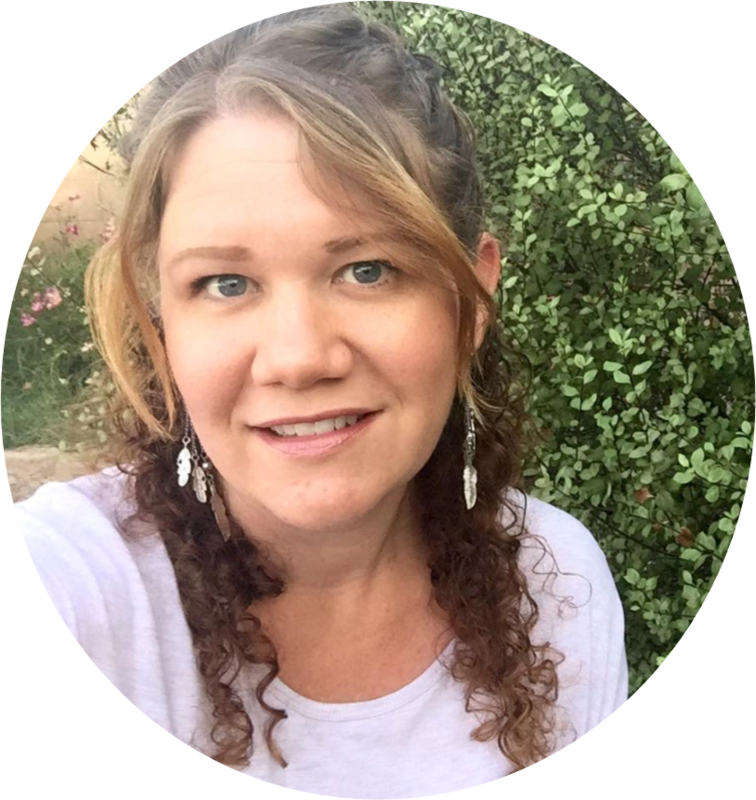 "I love to create jewelry and accessories with a variety of materials, and my designs are often inspired by nature, vibrant colors, and every-day happenings around me. I launched my Etsy shop in November of last year and I'm enjoying every minute of it!! Many of my silver pendants and charms are created with Precious Metal Clay, and earth-friendly material composed of recycled silver and organic clay binder. When heated to high temperatures the binder burns away and it becomes 99.9% silver." Her jewelry and hair flowers are super stylish! I am thrilled that she is willing to share one of her necklaces with one lucky follower! Here is a small sampling of what she has to offer in her store. This cute wrap bracelet also functions as a super stylish head wrap! It looks amazing either way .. and I totally LOVE versatility!!! 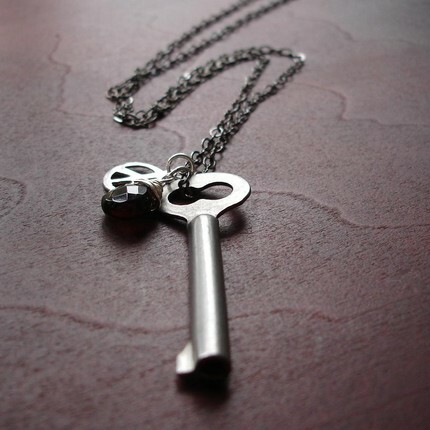 This is her Vintage Skeleton Key with Peace Sign and Smoky Quartz Briolette Necklace. So gorgeous!! It is featured on a 25 inch chain -- but she can shorten it if you prefer. 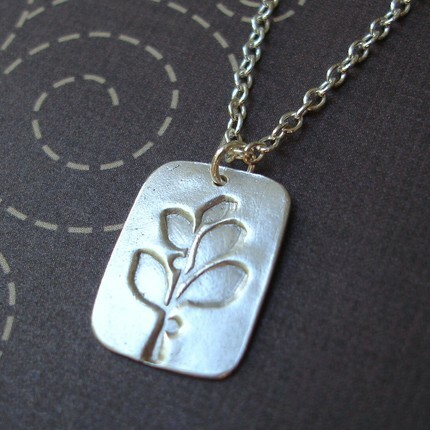 Her Olive Branch Pendant is another great necklace in her shop. This simple design is sure to liven up any outfit!! Here is the necklace that she has graciously offered to one lucky follower!! A lemon jasper bead, aqua shell drop, and a yellow chalcedony bead hang on a sterling silver ring. The pendant is strung on a brown cotton cord with an adjustable sterling silver lobster clasp. 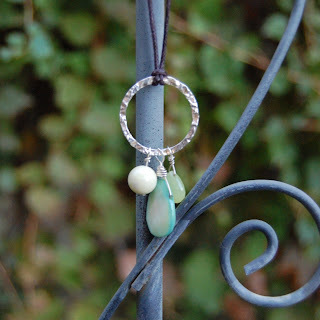 A small blue chalcedony drop is attached to the end of the clasp to accent the back of your neck as well. 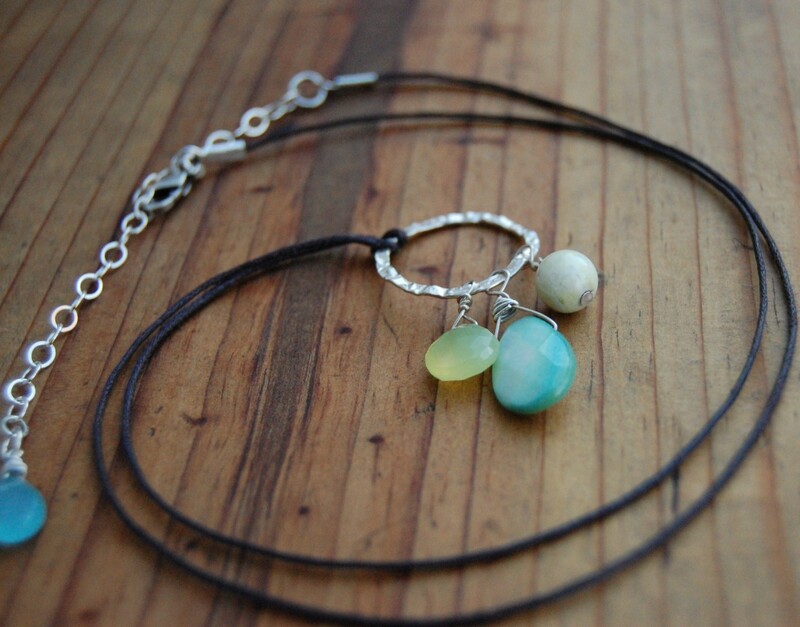 These calming colors come together to create a gorgeous, simple, and natural accessory. Necklace length: 22 inches with another 3 inches of chain on the adjustable clasp. 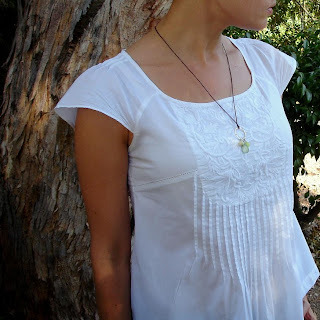 You can adjust it to be longer or shorter, depending on the neckline of your shirt or blouse. Awww, her store is lovely. I would love the fine silver petals! It is so delicate looking. i would pick the olive branch pendant .. so cute! I love the teal blue hair pin. So fun! Stopping by from Friday Follow and I can't help but to enter this giveaway! Thank you for the intro to this etsy artist! Wonderful offerings...I am partial to the white blossom wrap and the fabric flowers. I think my daughter would love them. 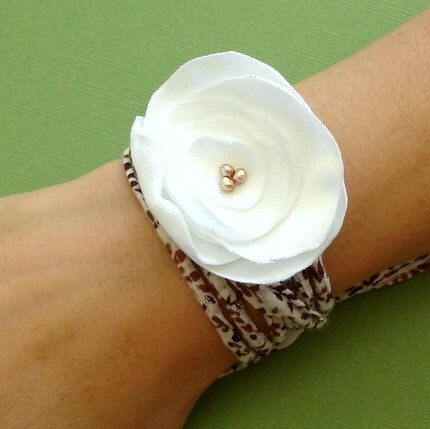 The flower wrap bracelet is adorable!! She is truely talented! I'd love the white blossom headband/wrap bracelet. Public follower of Kdbuggie boutique. Public follower of Kdbuggie boutique #2. I'm already a fan of Nikki's creations and love the Olive Branch Pendant on the silver chain, too. Nikki's creations are beautiful. I have several colors of the rose hair pins. My daughters take them from my jewelrybox all the time! I would love the Two Blooms Wildflower pendant. I like Fine Silver Sea Shell Silk Wrap Bracelet. I love the winged heart wrap bracelet — so unique and beautiful! I like the fine silver waves bracelet - very cool jewerly. I would love to win the skeleton key necklace SOOO cute!!!! I love the items you make, so creative, I wish I was creative! can't wait to see what else you will make in the future! so glad I'm following you now. I'd love the Two Blooms Wildflower Pendant on Sterling Silver Chain. What a great giveaway!! I love so many items from her store including both ASHA wrap bracelets, the Fine Silver Petals necklace, and the Olive Branch pendant. I'm a new Google Friend follower of KD Buggie Boutique (under the name jakaja08). I love them all : ) Great shop she has! I would love to have the silver petals necklace. I would love to have the Teal Blue Hair Pin. Pretty! I would love to own the Fine Silver Petals Necklace! I am a public follower of KdBuggie Boutique. I am a fan of KdBuggie Boutique on Facebook. I am following KdBuggie Boutique on Twitter. I love the hair flowers and the wrap bracelets! 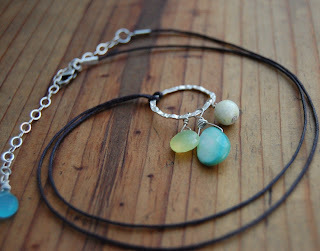 I love love love the olive brach necklace AND the one she's giving away- the lemon jasper aqua shell. Shades of blue and green are my favorite! I love Nikki's Fine Silver and Capri Blue Chalcedony Earrings. I am a fan now on Facebook. 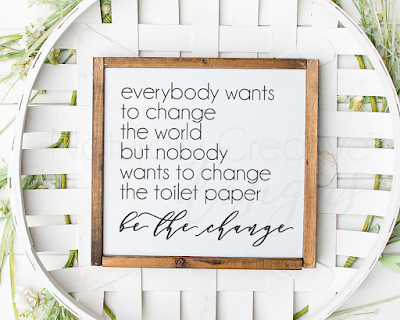 I just blogged about your giveaway. I would love to own the Fine Silver Mini Rainbows Pendant on Sterling Silver Chain.